Delaying the prescribed prayers due to being busy at work…. Many among the workers delay the Dhur and Asr prayer until night time and then pray them together due to either being busy with their work, or that their clothing was impure, or unclean. What is your advice to them? It is neither permissible for a Muslim man nor a Muslim woman to delay the obligatory prayer beyond its prescribed time; rather it is incumbent upon all Muslims who have reached the age of puberty to perform the prayer at its prescribed time according to their ability. The worker is not excused for delaying it (i.e. the prayer), and likewise impure and dirty clothing is not an excuse. 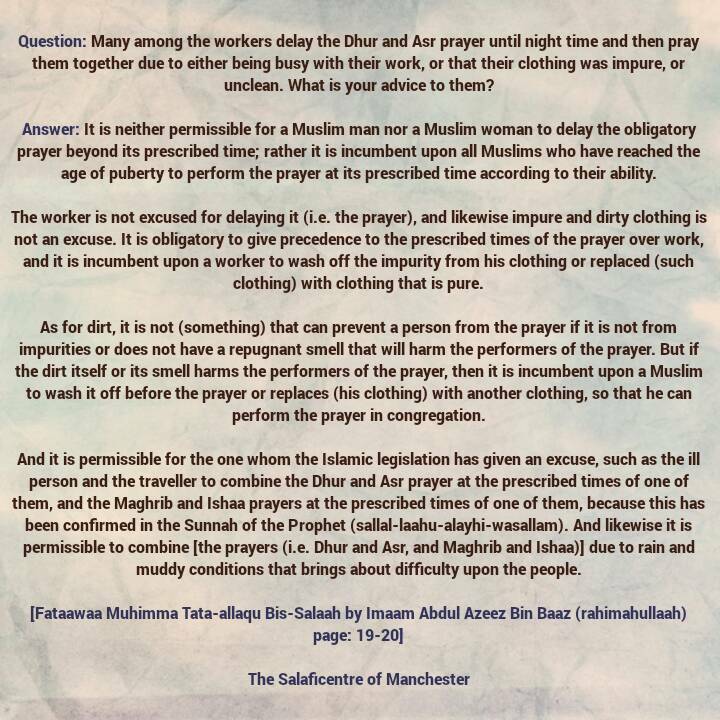 It is obligatory to give precedence to the prescribed times of the prayer over work, and it is incumbent upon a worker to wash off the impurity from his clothing or replaced (such clothing) with clothing that is pure. As for dirt, it is not (something) that can prevent a person from the prayer if it is not from impurities or does not have a repugnant smell that will harm the performers of the prayer. But if the dirt itself or its smell harms the performers of the prayer, then it is incumbent upon a Muslim to wash it off before the prayer or replaces (his clothing) with another clothing, so that he can perform the prayer in congregation. 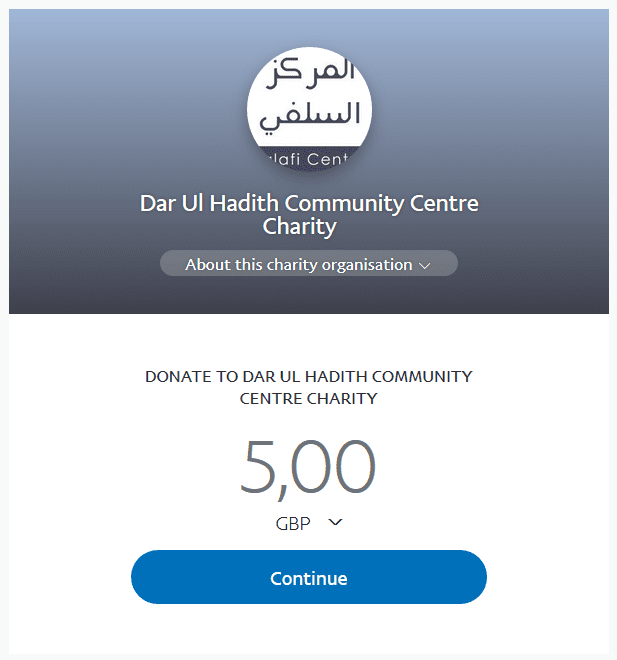 And it is permissible for the one whom the Islamic legislation has given an excuse, such as the ill person and the traveller to combine the Dhur and Asr prayer at the prescribed times of one of them, and the Maghrib and Ishaa prayers at the prescribed times of one of them, because this has been confirmed in the Sunnah of the Prophet (sallal-laahu-alayhi-wasallam). And likewise it is permissible to combine [the prayers (i.e. Dhur and Asr, and Maghrib and Ishaa)] due to rain and muddy conditions that brings about difficulty upon the people.